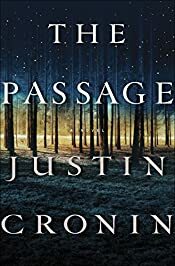 I was hesitant about reading The Passage, by Justin Cronin; I loved the premise of the book (a secret government project to create super warriors ends up unleashing a deadly vampiric virus onto an unsuspecting world – I ask you, how could I resist? ), but I was uncertain because of the dystopian nature of the book (those of you who know my reading likes and dislikes fairly well probably aren’t surprised; I have several books on my list I’m hesitant about simply because they’re dystopian). But one day, I was feeling a little bored, and fooling around with my iPhone (which happens to be one of the best little tools for alleviating boredom that I know of), and I ended up downloading the two free preview chapters of the book from one of my favorite ebook sites. And let me say, he is so right. I literally read those first fifteen pages and I was captivated. After thirty pages, and I could not put the book (or rather, my iPhone) down. It’s a hefty tome, weighing in at 784 pages, but I read it all on my iPhone, and when I finished the last paragraph, I did so reluctantly, not wanting to leave the world Cronin had weaved. I think it’d be a little silly of me not to acknowledge that The Passage is, in a number of ways, overtly different from my other books. But rather than calling it a ‘departure,’ I’d prefer to describe it as a progression or evolution. First of all, the themes that engage me as a person and a writer are all still present. Love, sacrifice, friendship, loyalty, courage. The bonds between people, parents and children especially. The pull of history, and the power of place, of landscape, to shape experience. And I don’t think the writing itself is different at all. How could it be? You write how you write. And I think this is exactly why the The Passage gripped me so tightly. Yes, it was a fabulous thriller of a book, about a vampire virus running rampant, a world pushed into destruction, and the power of the human race to continue living despite it all. The plot was breathtaking in its breadth and excitement, exactly the kind of thing I like in a book. But at The Passage’s core are those themes that Cronin talks about – love, sacrifice, friendship, loyalty, courage. And this is what makes the book such a beautiful read. It says a lot that today, about two weeks after I finished the book, I still remember all the main characters. They remain so very vivid to me. If book two begins with these same characters, I know they will come back to me immediately, as full of life as when I read the final pages; and if book two begins with different characters, I have the utmost faith that I will be drawn into the new story immediately. And the dystopian aspect? I loved it. The dark, bleak hopelessness that I associate with dystopian fiction isn’t what dominates the book; it’s a dystopian world that, despite everything, is filled with so much human hope and potential. When I first finished reading this book, and began thinking about writing this post, all I could think of saying was, “Wow. Wow. Wow.” And “OMG, you’ve GOT to read this.” I still want to say these things, and so I’ll end my post this way. The Passage is an incredible, absolute wow of a read. Read it, and you’ll be captivated. If you’re at all uncertain, do what I did – download the free preview chapters from your favorite ebook site, and take the plunge. And a PS: despite the vampire virus/destruction of the world theme, there is minimal blood and gore. Cronin’s writing is wonderful, and he’s quite able to provoke an emotional response from the reader without the need to be extreme. This entry was posted in Books and Reading, Reviews and tagged dystopian novels, ebooks, fantasy, Justin Cronin, vampires on June 30, 2010 by Belle Wong. What a glowing testament about The Passage! Holy moly! You read this on your iPhone! .-= Serena´s last blog ..Silver Lining to the Sookie Stackhouse Reading Challenge Failure =-. I don’t think I really realized just how big the book is until I wrote this post and looked it up on Amazon! But yes, it was so easy reading it on my iPhone, and I liked that I could read it easily in bed at night and not disturb anyone I think my son would like it, so I might buy the book in print, too, because he’s kind of adverse to the whole ebook idea. I’m just amazed that you read it all on your iphone…but I guess not knowing how big it was to start with helped. I don’t read on computer or phone screens and I definitely don’t read books that are more than 500 pages…this will be a true test for me when I get this book. I’m with Serena…I have this book on my shelf at home and I couldn’t imagine reading it on a phone! I’m glad you liked it though..I’m hoping to get to it by the end of July. .-= Jo-Jo´s last blog ..Audiobook Review- Worst Case by James Patterson and Michael Ledwidge =-. Such a glowing review! I had kinda of dismissed this one as something I wasn’t interested in, but I think I need to reevaluate. .-= carol´s last blog ..Wordless Wednesday =-. Wow, I wonder how many times you had to scroll up on your phone? Everyone seems to be loving this, but I’m still kind of worried about the vampires. There’s no scrolling required on the iPhone – that’s probably why it was so easy to read on it! The Passage has definitely won a place on my “don’t miss this” list, Kathy, and considering its subject matter, it’s really not very graphic at all. I’m thinking about getting it in audio, and I can’t listen to anything too extreme! Wow – I can’t over that you spent all that time scrolling through your iphone to read this! Well, I wouldn’t advocate trying that with The Stand – it weighs in at 1153 pages! .-= rhapsodyinbooks´s last blog ..June 29- 1900 – Birthday of Antoine de Saint-Exupéry =-. No scrolling necessary – that might be why I like reading with my iPhone so much! I’m almost convinced but not entirely – the vampire virus sort of does me in. However, I’m so glad you found a book that had such a huge effect on you – books like that are such a wonderful experience. After all, finding something like that is why we read. Right? .-= Barbara´s last blog ..Sharyn McCrumb is Back with a New Ballad Novel =-. Exactly – and not only that, the book made me really think about my own writing too. How I want to write. Because if I could do what Cronin does – well, I’m having trouble right now even imagining that! But I’d love to be able to write so beautifully and at the same time, tackle what some would call a “bestselling” plot. I didn’t find the vampires themselves to be too scary – but they made excellent bad guys, that’s for sure! I had absolutely no interest in reading The Passage…until now! I’m so happy to hear you enjoyed the book and to read your review. I have this one on my shelf at home. It is coming on an upcoming camping trip with me. I cannot wait to read it! I haven’t heard of this one yet – sounds interesting though. I’ll have to check it out! .-= Jemi Fraser´s last blog ..Awesome Versatility =-. I also haven’t yet heard of this book. But you definitely make it sound interesting enough to give it a read! I lvoe the new design by the way, looks fabulous and very YOU! .-= Chrissie´s last blog ..Better Late Than Never =-. With much thanks to YOU, of course! I ended up having to wade into the custom CSS but that’s still better than the hooks! I keep going back on forth on whether or not to go pick this one. I am now really thinking of getting it! .-= Nan´s last blog ..Nan’s Notes- Refresh- Refresh =-. I will be reading this book in 2 weeks, and I so can’t wait! All jittery! Plus, I love dystopia! .-= Aths´s last blog ..Month in Review – June 2010 =-. Okay, you’ve sold me. I’ll be keeping an eye out at the library. This seems like a love it or hate it book … I hope I love it! .-= Jenners´s last blog ..July Giveaway =-. I am so impressed that you finished a book on an iPhone. I have an iPod touch and a Kindle. I’ve never tried to read on the iPod touch, even though I have the Kindle app on it. As for the Kindle 2, my husband got it for me for Valentine’s Day and I was finally able to finish my first book on it two days ago. Don’t know what the problem was. As for The Passage, I see a lot of people are loving it. I think I’ll download a sample. .-= Trina´s last blog ..OMG- I Need More Lists- =-. Pingback: Fabulous Reading Streak – Ending, or Just Beginning?